This FREE star themed activity is great to use any time of the year, but is perfect for the Christmas/Chanukah/Kwanzaa season. Students will rearrange equations into slope-intercept form (solve for y in terms of x). 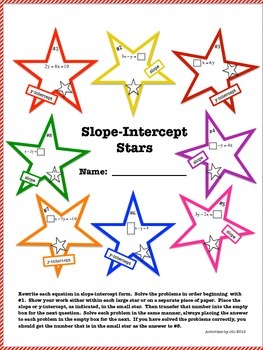 Then they will identify the slope or y-intercept. Make practice more fun with this eight question self-checking activity! An answer key is included along with an optional student outline for showing work. The download includes both color and black-and-white copies of the worksheet. Slope Intercept Stars by Activities by Jill is licensed under a Creative Commons Attribution-NonCommercial-NoDerivatives 4.0 International License.